Have the Black Friday Blues? Scene75 has the solution for you that will make your holidays bright… and you can finish your holiday shopping here too! This year, we will be having a raffle for one of this holiday season’s biggest gifts, the Nintendo Switch! 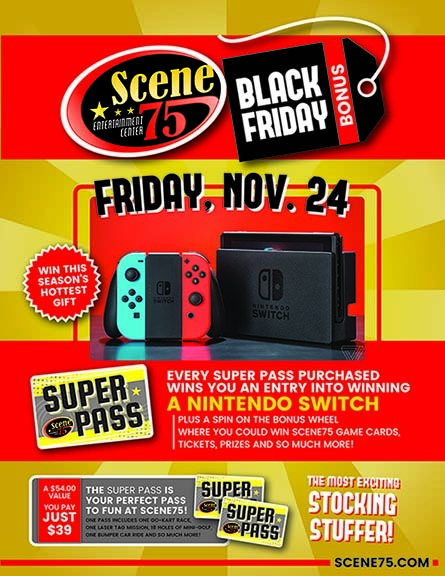 Visit us on Friday November 24th from 11 AM to 1 AM for a chance to take a spin on the Scene75 BIG WIN wheel! For every Super Pass purchased, you will receive one entry into the raffle + a spin on the BIG WIN wheel, where you could win more awesome prizes and game cards! Another raffle entry to win the Nintendo Switch! Scene75 Game Cards make great stocking stuffers! So skip all those long lines at the mall and give your loved ones the gift they really want this year!